Get the best service and rates by dealing direct with Green Island Resort. Large, spacious room perfect for a tropical island family escape or an escape from the family. Spacious guest room of 56 square metres, with two double beds. All rooms with separate bath and shower, and private balcony. Set in clusters under the rainforest canopy and adjoining central facilities. Connecting rooms available at additional cost – Island Suite Twin rooms interconnect with an Island Suite King room. Your stay also includes return catamaran transfers with Great Adventures from Cairns Reef Fleet Terminal, complimentary sunset drinks, glass bottom boat tour, rainforest and guided evening nature walks, fish feeding presentation daily, snorkelling equipment and most non-motorised beach activities such as kayaking, beach volleyball and windsurfing. Spacious, private and romantic. Perfect for honeymooners or a special island getaway with your partner. The Reef Suite features split level luxury of 66 square meters, large king sized bed, spacious lounge area, separate bath and showers and private balcony. Set in clusters under the rainforest canopy and adjoining central facilities. Experience a wonderful Green Island getaway - includes BONUS Daily Buffet Breakfast and Offshore Island Snorkel Excursion. Your stay also includes luxury accommodation in an Island Suite, return catamaran transfers with Great Adventures from Cairns Reef Fleet Terminal, complimentary sunset drinks, glass bottom boat tour, rainforest and guided evening nature walks, fish feeding presentation daily, snorkelling equipment and most non-motorised beach activities such as kayaking, beach volleyball and windsurfing. The Island Suite Twin guest room features 56 square metres, with two double beds. All rooms with separate bath and shower, and private balcony. Set in clusters under the rainforest canopy and adjoining central facilities. Children from 1-14 years stay for free in Island Suites in existing bedding when sharing with adult/s. Family pass to Marineland Melanesia, with a family photo taken with a crocodile. Return fast catamaran transfers from Cairns with Great Adventures. Invitation to Sunset drinks and daily fish feeding presentation. Plus all our great value-add standard inclusions. Green Island is located just off the coast from Cairns on the Great Barrier Reef. This ancient coral cay is home to over 120 species of native plants, colourful bird and marine life and beautiful coral gardens to explore. With just 46 luxurious suites nestled amid lush rainforest and secluded from the day visitor facilities, one of the hallmarks of Green Island Resort is its unique reef and rainforest setting. Green Island is the only coral cay in the Great Barrier Reef with a rainforest. One of the most eco-sensitive developments in the world, Green Island Resort passionately balances the needs of our guests and the protection of our World Heritage environment. As a national park located within the Great Barrier Reef Marine Park, Green Island has been a popular day visitor destination for generations with guests from around the world experiencing this unique World Heritage area every year. By night, experience the pure serenity of your own tropical island retreat. Green Island Resort has two styles of accommodation; Reef Suites and Island Suites. Each is elegantly appointed and features private balconies with either rainforest or pool views. With just 46 luxurious suites, privacy is assured in this tranquil setting. Retreat to your intimate haven nestled amid the lush rainforest and secluded from the day visitor facilities. Split level luxury suites of 66 square metres, large king size bed, spacious lounge area, separate bath and shower, and private balcony. Set in clusters under the rainforest canopy and adjoining central facilities. Spacious guest room of 56 square metres, either double or twin rooms, some inter-connecting or adjoining. All rooms with separate bath and shower, and private balcony. Set in clusters under the rainforest canopy and adjoining central facilities. Green Island Resort’s signature restaurant, Emeralds, has undergone a lovely makeover. In tune with the fresh new feel, here’s a sneak peak at Executive Chef Shuki Salem’s delicious dinner menu. Emeralds Restaurant features outdoor terrace dining or indoor air-conditioned seating and is open for breakfast, lunch and dinner. Great Adventures was honoured to showcase Green Island on the Great Barrier Reef to the China State Councillor Madame Liu Yandong on 14 December 2012. On arriving at Green Island the guests participated in a glass bottom boat coral viewing trip to see turtles, clams, colourful corals and fish with Chinese commentary followed by a walk along the beach.Madame Liu Yandong was accompanied by Quicksilver Group Managing Director Tony Baker and Environmental Manager and Marine Biologist Dougie Baird. Tony Baker said ” With direct flights from China to Cairns we are seeing more Chinese travellers arriving to visit the natural wonders of our Region. It was wonderful that Madame Liu Yandong had the opportunity to visit the Great Barrier Reef which is a highlight for our visitors to Cairns”. Matilda, a Hawksbill sea turtle is becoming a frequent traveler on Great Adventures Cruises to Green Island. The Cairns Turtle Rehabilitation Centre and Great Adventures will release Matilda for a second time into her home waters of Green Island on Thursday 17th. In May 2010, the Cairns Turtle Rehabilitation Centre and Great Adventures released Matilda into the waters around Green Island after being in rehabilitation for 19 months. Matilda was the first turtle on the Far North East Coast of Australia to have a satellite tracking device attached to her back which has given a fascinating insight into turtles in the wild. We stayed 1 night on a whim and fell in love with Green Island. Since then, we have returned 3 more times and its always on our mind to get back there. The reef around the island is amazing snorkeling and the resort staff are the best. There's nothing like the serenity of having a drink and watching the sunset here. 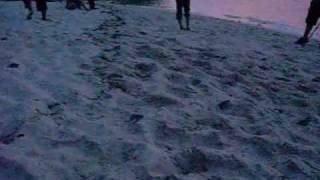 We always get up at sunrise and are out in the water to wake up the turtles. Every time we go snorkeling we see something different so I don't think we will ever see it all. It's peaceful when the day trippers go. The staff are great and helpful, food excellent, rooms so grand, clean and comfortable. Swimming and snorkelling are brilliant, as is the glass bottom boat and fish feeding, bit expensive to see the crocks, for staying guest that should be free. If you haven't been there, then treat your self for an over night at least. 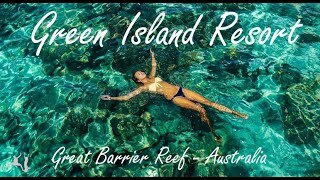 Located on the Great Barrier Reef, Green Island is just 27km, a 45 minute boat ride from Cairns with Great Adventures high speed catamarans. These transfers are complimentary for house guests and are confirmed at the time of booking. * Turnaround vessel, departure times may vary. Helicopter transfers from Cairns or Cairns International Airport.